Wait. Hold on a minute. Is Christmas really in a few days? How did that happen? I’m trying to figure it out yet all I see is a blur of time passing. Old Father Time keeps on ticking away the minutes. Sometimes I wish he would slow it down. Only thing to do is deal with the time at hand. Or look for solutions when it slips away and faced with last minute situations. 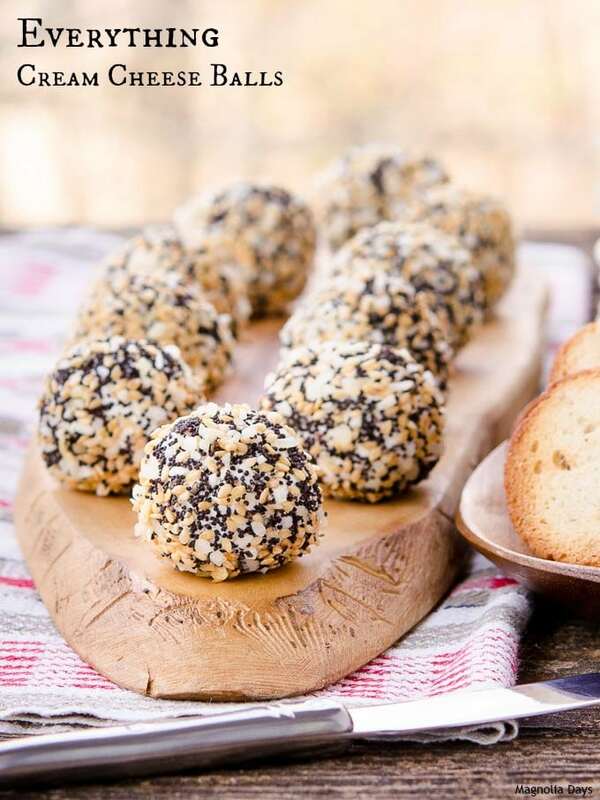 Everything Cream Cheese Balls is one of those solutions. It’s a double bonus recipe. I’ll fill you in on those details in a bit. There are a lot of good adjectives for this recipe. Easy, quick, and make-ahead fall into the last-minute category. Measuring, stirring, beating, and rolling is all involved in the process. You could even wing it on the measuring part and adjust to your taste preference. Like more poppy seeds? Add more in the mix. Major garlic fan? Add another clove. Likewise for omitting something if you prefer it not be included. Quick is a relative term. What may be quick for one person could be different for another. It is about one minute to beat the seed mix into the cream cheese. What takes a little more time is rolling it into balls. You can always get a helper for it. I’ve heard kids come in handy for things like this. Besides, getting kids involved in cooking is a good thing. Make-ahead is the really nice part. Everything Cream Cheese Balls last for days in the fridge. I think they get better after a day or two. This brings me to the bonus part. First you serve it with bagel chips for an appetizer. Then you serve the leftovers the next morning with bagels for breakfast. How great! Just make sure to not let them set out too long the evening before as food safety is extremely important. Or keep some separate in the fridge to be used for breakfast. You can always pull out those from the fridge if the appetizer ones disappear and folks want more. 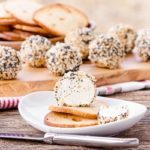 How are the Everything Cream Cheese Balls? They are soft, creamy, and have all the flavors of an everything bagel. There have sesame seeds, poppy seeds, onion, garlic, salt, and pepper inside and out. Scrumptious is another adjective I would use to describe them. You could even add some heat with cayenne pepper or sriracha seasoning if you want. Are you ready for the holidays? If time has slipped away with you, scroll down to find a list of last minute recipes. The Sunday Supper tastemakers are sharing ones for appetizers to desserts and every course in between. Also take a look at my Sriracha Spiced Peanuts, Tiger Butter Candy, and Pressure Cooker Honey Ginger Butternut Squash for more options. 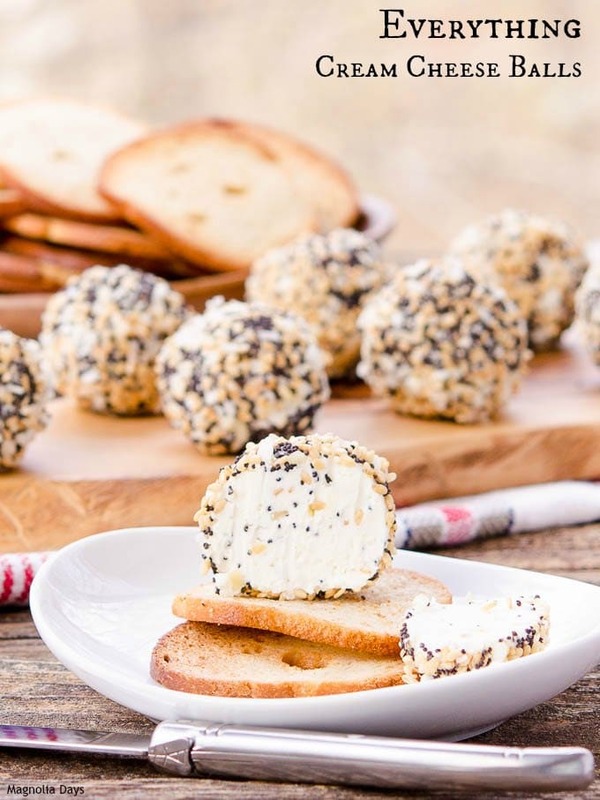 Everything Cream Cheese Balls is a fantastic appetizer served with bagel chips. It has all the flavors of an everything bagel with cream cheese. 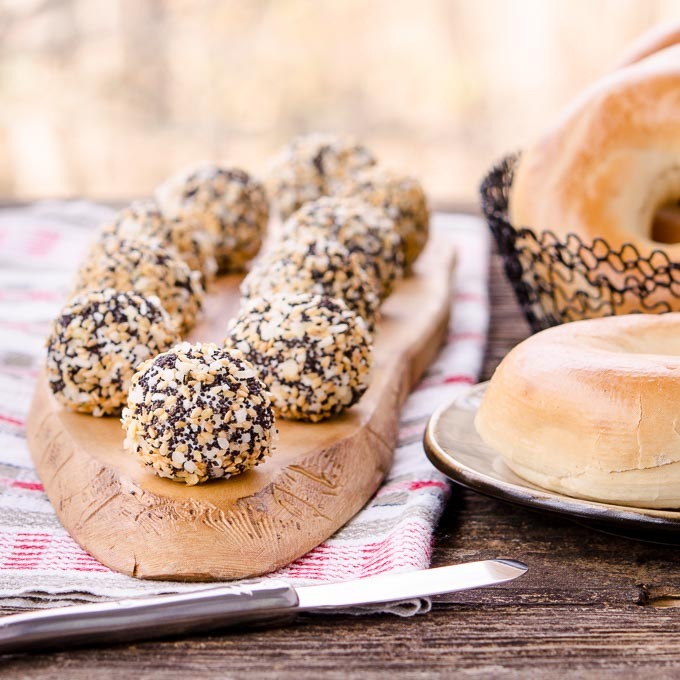 Combine sesame seeds, poppy seeds, onion flakes, pepper, and salt in a small bowl. Beat cream cheese, garlic, and 2 tablespoons seed mixture until combined. Chill for at least 1 hour to firm up mixture and make it easier to roll into balls. Scoop 2 tablespoon portions and roll into balls. Roll balls in remaining seed mixture, pressing to coat. Chill balls at least 2 hours prior to serving. Serve with bagel chips or crackers. Can also be used as cream cheese spread for bagels. Time stated does not include time for chilling mixture. Recipe adapted from Good Housekeeping magazine, November 2015 edition. Is time slipping away from you? Check out these last minute holiday recipes by Sunday Supper tastemakers. They can help you with having a tasty party or feast for your family and friends. Hands down my favorite bagel is everything, and I hate that I don’t eat these flavors more often. 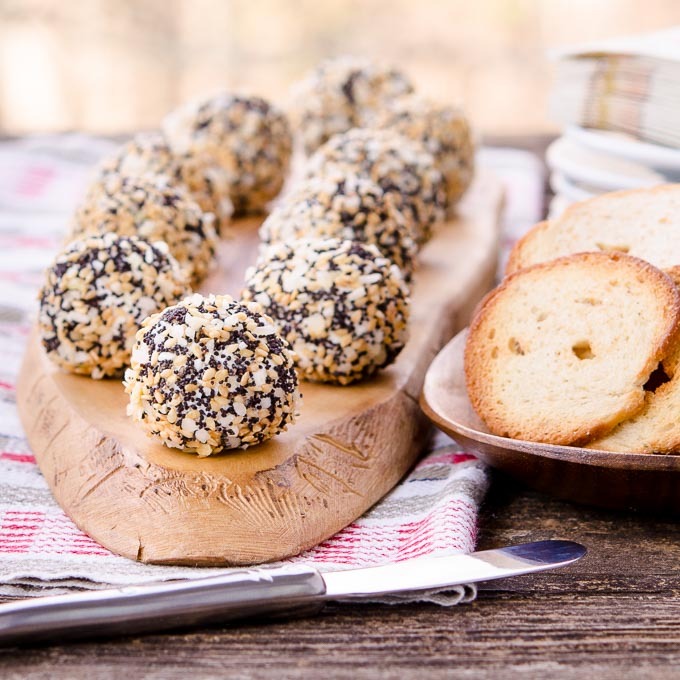 I make an everything cracker that would be amazing with these cream cheese balls. What an easy appetizer idea! And perfect solution for the leftovers! Genius. I really love this idea! We are huge everything bagel fans in this house! I like your flavors, and the decorations. This is a brilliant way to serve cream cheese anytime. I’m going to start doing this as a special touch for the brunch table. I know it will be a hit!